Salt Lake rallies for Cody Belgard, shot in the back and killed by SLCPD | Fight Back! Salt Lake City, UT - Cody Belgard was a protector, a gentle man, a talented emcee, a loving and playful father, a loyal brother. These are just some of the ways family members described Belgard as they mourned his death at the hands of a Salt Lake City officer, who shot him in the back. Despite cold rain and even a few flakes of snow, they stood in front of a Salt Lake City Police Department station, along with more than 50 supporters, on November 17 to demand answers: What happened? Why did offices shoot? What ‘altercation’ occurred? Where is the footage? Why did police wait for days before allowing the family to view his body? Where is the justice for Cody? The rally was organized by Utah Against Police Brutality (UAPB), the Rose Park Brown Berets, and the family. SLCPD claims that Belgard “rammed” a police car and then fled earlier on the night of the shooting. The department says he was “noncompliant” when they approached him later. However, they refuse to offer explanations for why he was stopped and pursued in the first place. Nomi Armijo, a witness near the shooting and friend of Belgard, told the Salt Lake Tribune that she saw Belgard walking near her home, carrying nothing, shortly before he was shot. An officer with his gun drawn then approached Armijo and demanded she “Stay in the car, don’t move.” A police vehicle with no lights or sirens then sped by. Moments later, Belgard was shot in the back. Belgard was also a well-known emcee in Salt Lake’s hip-hop scene, known as SEE-SMOKE. His rhymes often focused on life on west side of the of the city. Rally attendees paused to listen to one of his tracks, his now-silenced voice echoing around the buildings and streets he had loved. 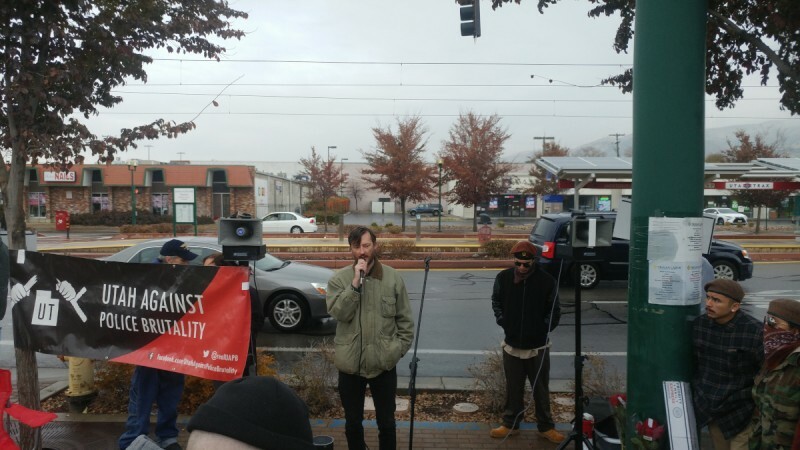 Utah Against Police Brutality organizer Dave Newlin demanded that the city adopt the group’s proposed ordinance, which would give control over police back to the people through an independent, elected oversight board. The Salt Lake Civilian Police Accountability Council (SLCPAC) could investigate shootings like Belgard’s and fire officers who kill people. The SLCPAC would also have broad authority to investigate and discipline police for all forms of misconduct, as well as take residents’ complaints, release body camera footage and other records to the public and reject bad departmental policies. The shooting is currently being investigated by the nearby West Valley City Police Department, the most notoriously corrupt agency in the valley. West Valley City Police Department’s narcotics unit was disbanded in 2013 when they were found to be stealing money from crime scenes and mishandling evidence, leading to more than 100 cases being thrown out. It has since been reinstated. More recently, West Valley police killed Elijah Smith, who was raising his hands in the air when an officer shot him. Brown Berets organizer Anthony Fierro specifically called out Salt Lake City Council member James Rogers, who represents the Rose Park area of the city, where Belgard lived and ultimately died. Rogers recently voted to spend roughly $6 million to hire new police officers, and he has welcomed increased police presence in Rose Park as the neighborhood begins to gentrify. Fierro called on Rogers to start supporting community control and asked residents to contact Rogers and bring up SLCPAC at local council meetings. Longtime family friend Marvin Oliveros connected the shooting to misplaced police priorities and needless criminalization of marginalized people. “They continue to get more funding to hire more police officers to criminalize addicts, to criminalize homelessness, and to criminalize the general public - and anything they deem in opposition to their goals,” Oliveros said. UAPB organizer Deb Blake said that the group will continue to stand by Cody Belgard and his family for the long term to demand and ultimately win justice.